J.M. Aucoin is an historical fiction writer and I'm pleased to host him on his Historical Fiction Virtual Book Tour today. He's the author of Honor Among Thieves, a gripping tale of daring sword-play and political intrigue in 17th Century France. What makes this author stand out from the rest though, is that he loves fencing and creating his own historical costumes. He doesn't just just write historical fiction, he lives and breathes it! When not writing, he practices historical fencing, crafts historical outfits, and covers the Boston Bruins for the award-winning blog Days of Y’Orr. For more info visit J.M. Aucoin’s website and blog. You can also find him on Facebook, Twitter, Goodreads and YouTube. Anyone who knows me knows how big of a swashbuckler fan I am. Zorro. The Three Musketeers. Captain Blood. Pirates of the Caribbean. If it’s a book or movie with someone wielding a sword, there’s a good chance I’ll love it. I’ve been like that as wee lad, watching reruns of Zorro starring Guy Williams on the Disney Channel. I must’ve gone as Zorro almost every year for Halloween as a kid. Of course, not much has changed in the decades since then. I just have a slightly bigger budget and a finer appreciation for natural fabrics. And as much as the flashing steel glinting heroically in the moonlight caught my captivation as a small child, the clothing of 17th Century also caught my attention. The leather gloves, wide-brim hats with impressive plumes, bucket boots, spurs. Seriously. Who wouldn’t want to dress like these guys? It’s this 17th Century cavalier/Musketeer look that I go for when I’m making my own garb. 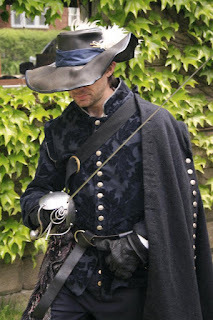 Along with writing historical adventure novels and piratical short-stories, I also sew and fence in the Society for Creative Anachronism. It’s been a perfect place to let me live out my childhood dreams. J.M. Aucoin on the left, photo by Scott Tollefson. Garb making for me has the added challenge of making sure it passes the SCA “armor” requirements. 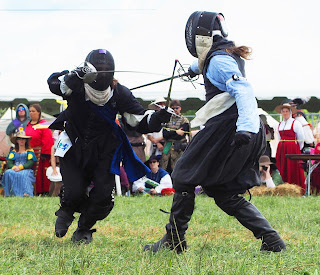 I won’t bore you with the details; just know that the clothing we wear while fighting also doubles as armor should a sword break (which is extremely rare) and then hit us. Like most things I do, I decide to jump in the deep end when I first started learning to sew. Most people would maybe start off with something simple like a sewing a winter scarf or maybe a puffy shirt. A handkerchief even. But being an “all or nothing” type guy, I decided I wanted to make myself a cassock and a 1630s-style doublet. J.M. Aucoin’s first sewing projects. 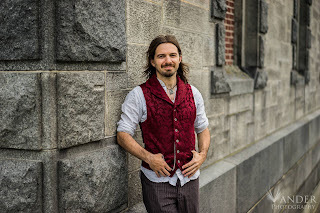 Photo by Tricia Augustine Sobo. A 100+ buttons later the cassock was done. Soon thereafter I had myself a fancy doublet. Having some go-to movies definitely helps pass the time when you’re hand sewing 100 buttons. Pretty sure I can quote Man in the Iron Mask from start to finish. I’ll admit, I had the good fortune of my fiancee, Kate, being an amazing costumer herself, and patient enough to teach me how make my own stuff. There were a lot of “Did I pin this correctly?” before running it through the machine. There were even more long nights with a seam ripper and rage quitting for a few days. A project isn’t official unless I’ve thrown it across the room in disgust, and Kate’s talked me off the ledge from abandoning it. There are few things I take into consideration when making myself “fight ready” garb. The first being range of motion. I’ve used some doublet patterns that didn’t scale well in the armhole, which lead to restrictive moments, the clothing pulling at weird spots, and seems ripping. Limited motion isn’t exactly what you want when someone’s flashing 3.5’ of steel at your face. So a lot of my doublets — especially some of the first ones I made — were sleeveless. Makes for full range and a little more breathability. And sometimes you just want some simple garb to fight to wear when fighting in the mud. The second thing I think about is comfortability/heat levels. I worry a little less about this than mobility since I know I’m going to be sweaty fencing regardless of what I wear. Sword fighting isn’t a neat & tidy business, after all. But I’m not going to wear my thick brocade doublet and full-length wool cassock lined in silk when it’s 90 degrees out and humid as hell out… at least, I won’t do that again… I learned my lesson… kinda. Lately, I’ve decided to up my garb game some more. Been looking at extent examples for inspiration and seeing some of the details used to adorn clothing in the 1600s. What type of trim they use and where they put it on their doublets and breeches. Clothes make the man, as they say. I’m far from an master tailor. I’m a competing costumer, but I’m merely a novice in terms of researching historical clothing. There’s always something new to learn, something new to try. 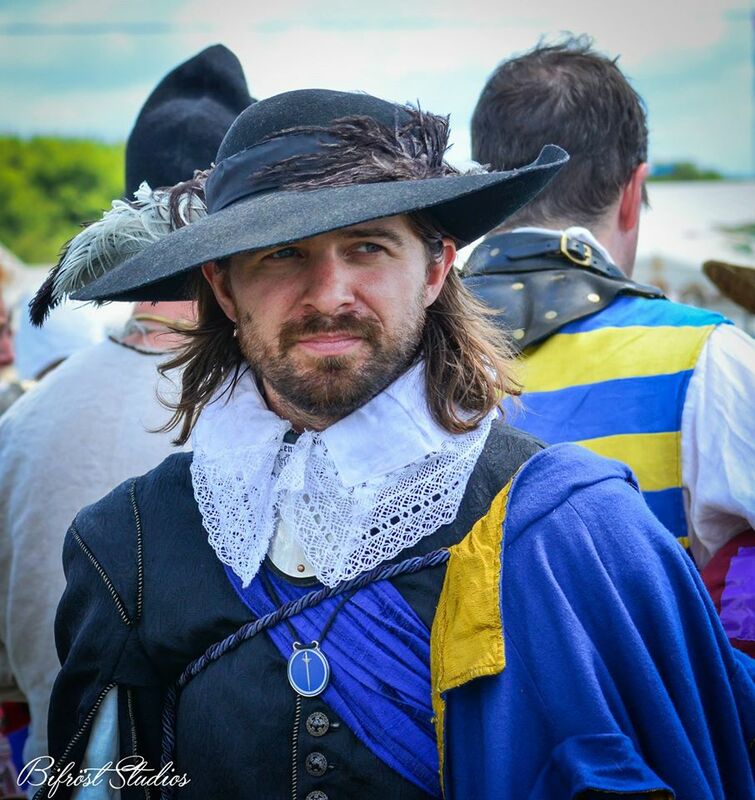 In the past year I’ve started adding the lace falling bands and hand falls to my doublets, giving that extra splash of dashing rogue that captivated me as a kid. A silk sash to show off an officer’s rank and a sense of valor. I’ve even drafted my own spur leather pattern and learned the basics of molding and finishing a cavalier hat (tip: it’s all about the plumes). If you told me 10 years ago that I would be making my own clothing and some of it would be made of lace, I’d probably die of laughter. And yet here we are. When not sewing or swashbuckling, J.M. Aucoin writes historical adventure novels. 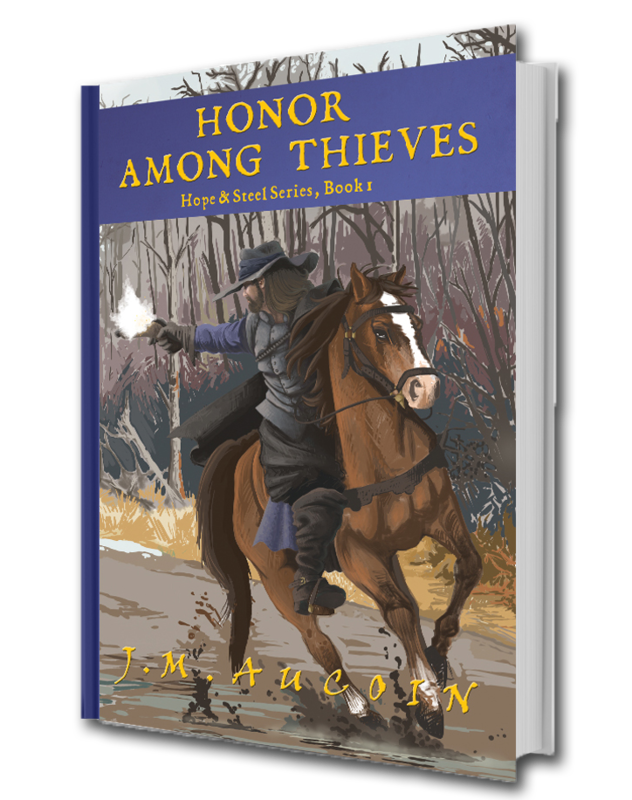 His debut full-length novel Honor Among Thieves is available in paperback and for Kindle. 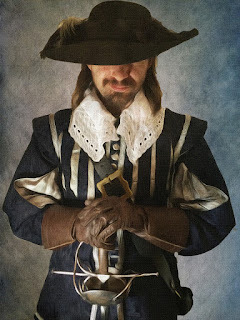 To keep up with his swashbuckling adventures, visit www.JMAucoin.com. For more on historical fencing or to follow J.M. 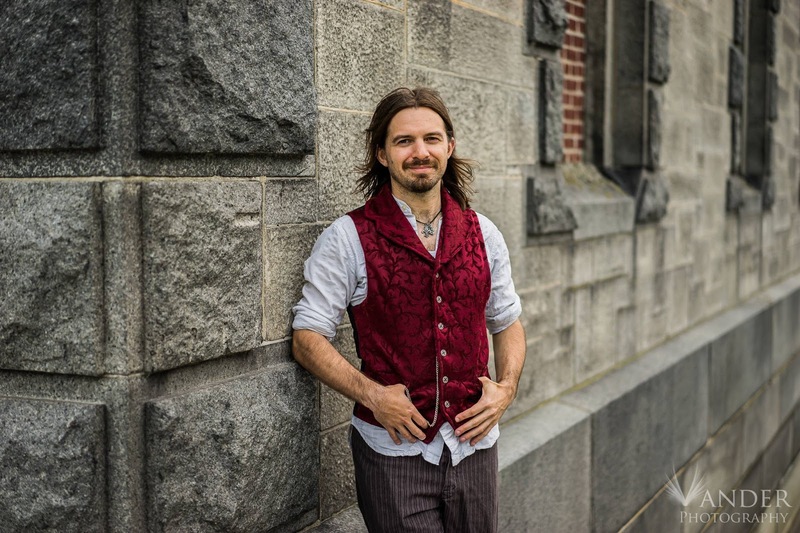 Aucoin’s historical costuming projects, visit TheTavern Knight’s Barracks. For more on his cosplay, please visit his Deviantart page. Check out the other stops on this blog tour below.